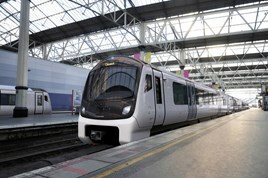 Bombardier will build 750 Aventra vehicles for the new South Western franchise. They will be formed into five-car and ten-car trains, and will enter traffic from mid-2019, with all in traffic by the end of 2020. A total of 90 trains are on order. FirstGroup and MTR have placed the £895 million deal, which is designed to provide 46% additional capacity at peak time. The trains will be maintained at Wimbledon. Funding is led by Rock Rail and partners SL Capital and GLIL Infrastructure LLP. Their introduction will enable First MTR to withdraw the Class 455, ‘456’ and ‘458’ fleets currently in use with South West Trains, and the Class 707 fleet that is yet to be introduced by SWT. For much more on this deal, read RAIL 830, published on July 5. For an in-depth round-up of all the new train orders, read RAIL 830, published on July 5. Just to clarify one point, are you saying the 707 fleet will be withdrawn before entering service? Replace not withdrawn would have been a better choice of word. They will be used in service for a limited period then hopefully another home can be found for them. Amazing to have such massive orders for a brand new platform that's still to enter passenger service. Be interesting to see 345 availability when it finally starts on the GE suburban. Well at least that it will keep Bombardier very busy on producing and manufacturing brand new trains not just for First MTR SWT but also the Class 345's that are currently being manufactured and some are on test runs which will soon be in service on TfL Rail and to replace the Class 315's on the Elizabeth Line fully opens in 2019. Plus next year-Class 710's will be built for London Overground to operate on the Lea Valley metro, Romford-Upminster, Gospel Oak-Barking and Watford-Euston "DC" services to replace the Class 315's, Class 317's, Class 172's and to replace the LO Class 378's to be transferred to East London Line services. And Class 720's to be built for Greater Anglia to replace the Class 90's Intercity (London-Norwich), Class 317's and Class 379's used on West Anglia and Stansted Express services and replacing the Class 321's and Class 360's used on Great Eastern routes. I think that the new trains that Southwestern Trains are ordering could be numbered in the Class 7xx category (Class 712 or Class 715). As Class 707's will be replaced by these new Aventra trains and could be transferred to Southern or c2c. So what that means is the Class 707's could go to Southern to replace the Class 455's. Or could the Class 707's end up scrapped. Or could the Class 707's could go to c2c and to move some of the Class 357's on Fenchurch Street-Grays via Rainham service. So where will the Class 707's go to. Could Southern might use the Class 707's to replace the Class 455's used on the South London suburban routes including the Cattenham Corner and Caterham lines. Or could the Class 707's end up getting scrapped. So when will the Class 707's go to. Or could it be scrapped!